Kelly Koumalatsos (Wergaia/Wemba Wemba), Benim wile. To cover over with possum blanket. Wergaia. print making ink on paper with linen thread. Winner of the Metro Tunnel Creative Program 2D Award. Image courtesy Art Almanac. Annual award and survey exhibition of Victoria-based Indigenous artists. An incredibly diverse and impressive show. We’re big fans of Kelly Koumalatsos’ stunning work incorporating possum fur and printmaking, as seen in the image above. One not to be missed if you’re baking in hot dry Melbourne over the summer break! Nonggirrna Marawili, Yathikpa 2013, natural pigments on bark, 138.5 x 91cm (irreg. ), Collection of the Art Gallery of New South Wales. Image courtesy AGNSW. ﻿Retrospective of the phenomenal work of Nonggirrna Marawili. Based in Yirrkala, North East Arnhem Land, Marawili is “inspired by the atmospheric effects that are created as country is brought to life through the movement of wind, water or unseen forces”. Marawili began her career as a printmaker, but in recent years has further refined her skills in painting to become one of the most distinctive Aboriginal artists working today. Elizabeth Dunn, artist working with Ernabella Arts. Image courtesy Art Guide Australia and Ernabella Arts. An exhibition about Australia’s two oldest centres for craft and design – Sturt Gallery and Studios (since 1941) and Ernabella Arts (since 1948). In the late 1960s Elisabeth Nagel, master weaver from Sturt in the lush green Southern Highlands of NSW, travelled to the remote Pukatja Community in far north western South Australia where she met Winifred Hilliard, the then-manager of the craft industry at Ernabella Mission. Together they sparked a ground-breaking residency initiative. The exhibition tells the story of that residency and offers a showcase of the contemporary work in painting, ceramics and tjanpi (native grass) weaving and punu (timber) work. One of the larger than life too-roo-dun sculptures created fir the Too-roo-dun project. Image courtesy Baluk Arts. Too-roo-dun is a Boonwurrung word for bunyip, which is a word from the Wathawurrung language of the Kulin Nation of Central Victoria. For the Too-roo-dun project life-sized bunyips were created by seven Aboriginal organisations including Winja Ulupna, Healesville Indigenous Community Services Association, Bunjilwarra, Mullum Mullum Aboriginal Cooperative, Willum Warrain, Casey Elders Yarn & Art Group and Baluk Arts. They are incredible! Pots Drying in the Sun, Hermannsburg Potters. Photo courtesy Hermannsburg Potters. What began as a series of workshops with artists in the community of Ernabella has grown into a nation-wide survey of Indigenous ceramics practice. Clay Stories: Contemporary Indigenous Ceramics from Remote Australia, a touring exhibition currently on display at Jam Factory: Seppeltsfield, is presented by Sabbia Gallery in partnership with the Remote Communities Ceramic Network. Landscape surrounding Ernabella Arts, South Australia. Photo courtesy Ernabella Arts. Artist Carlene Thompson from Ernabella Arts. Photo courtesy Rhett Hammerton. Arists Judith Pungkarta Inkamala from Hermannsburg Potters. Photo courtesy Jason McCarthy, National Museum of Australia. Western MacDonnell Ranges, landscape surrounding Hermannsburg Potters. Photo courtesy Jason McCarthy, National Museum of Australia. Hayley Panangka Coulthard, Palm Valley Into the Night. Photo courtesy Sabbia Gallery. Hayley Panangka Coulthard, Looking for Katjirra (Bush Raisins). Photo courtesy Sabbia Gallery. As Bruce McLean, Curator of Indigenous Australian Art at QAGOMA, says in his Clay Stories catalogue essay: “Indigenous Australian pottery and ceramics have a long and proud tradition within the canon of Indigenous Australian art history. Although many overlook the medium and misunderstand its historical importance, it has played a pivotal role in the establishment of many Indigenous art centres and the Indigenous art industry as a whole”. Work by Rupert Jack, 2017. Photo courtesy Sabbia Gallery. Work by Alison MIlyika Carroll, 2017. Photo courtesy Sabbia Gallery. The exhibition includes artists working through five remote art centres: Ernabella Arts, Tiwi Design, Girrigun Aboriginal Art Centre, Erub Arts, and Hermannsburg Potters. Each of these centres has a substantial history of ceramic practice, some dating back to the early 1970s. Ernabella (near the borders of South Australia and the Northern Territory) is home to the oldest continuously-running Indigenous art centre in Australia and has been operating Pukatja Pottery since 1998. The Tully River, Girrigun in Far North Queensland. Photo courtesy Valerie Keenan. Bathurst Island coastline, Tiwi Islands, Northern Territory. Photo courtesy Tiwi Design. Just ‘up the road’ (approximately 550 kilometres north of Ernabella), the Hermannsburg Potters have been pursuing their own idiosyncratic and highly sought-after ceramic tradition for decades. On the Tiwi Islands, in the community of Girrigun in Far North Queensland, and on Darnley Island in the Torres Strait Islands, entirely distinctive approaches to clay-making have been underway for many years. As Sabbia Gallery Curator, Anna Grigson, told us, “We soon realised that there was a very interesting movement happening within many of these art centres, and mostly in quite remote communities, who had difficulties accessing the broader public to show their work”. The artists in Clay Stories come to their ceramic practice from multiple perspectives. Some depict animals, plants and landscapes local to their homes; others evoke important ancestral stories. Anna says, “The Bagus from Girrungun Aboriginal Art Centre [for example] have their basis in traditional fire making implements…the Bagu was originally made in wood rather than clay”. Tiwi artist Jock Puatjimi makes marks and incisions on his clay forms, using traditional patterns and drawing on his background of as a carver and printmaker. Emily Murray, Bagu 2017. Girrungun Aboriginal Art Centre. Photo courtesy Sabbia Gallery. Emily Murray, Bunyaydinya Bagu 2017. Girrungun Aboriginal Art Centre. Photo courtesy Sabbia Gallery. Clay Stories is an important exhibition. It brings together a diverse group of artists to present an overview of contemporary Indigenous ceramic practice today. It also brings attention to a little-known aspect of Indigenous art history. With tour venues across the country through 2017-18, it’s well worth a visit. Tiwi artist Jock Puautjimi hunting for turtle eggs, Bathurst Island, Northern Territory. Photo courtesy Tiwi Design. Artist Jimmy Kenny Thaiday at Erub Arts. Photo courtesy Erub Arts. Clay Stories is on until 10 December at Jam Factory, Seppeltsfield. There are currently six tour venues confirmed across NSW, ACT, QLD, SA and NT, with more to be announced. See www.claystories.com for more information. This post first appeared on The Design Files on 10 November 2017. Erub Arts located on Darnley Island Torres Strait. Photo courtesy Lynnette Griffiths and Erub Arts. Mavis Ngallametta painting large-scale work. Photo: Gina Allain. Mavis Ngallametta’s large-scale paintings, a selection of which were exhibited at Martin Browne Contemporary in Sydney recently, are both derived from, and imbued with, the material richness of her natural environment. Incorporating white ochres from the cliffs of Ikalath on the west coast of the Cape York Peninsula, mixing fecund greens from a combination of yellow ochre pigment and charcoal - Mavis is both a master colourist and an alchemist of sorts. 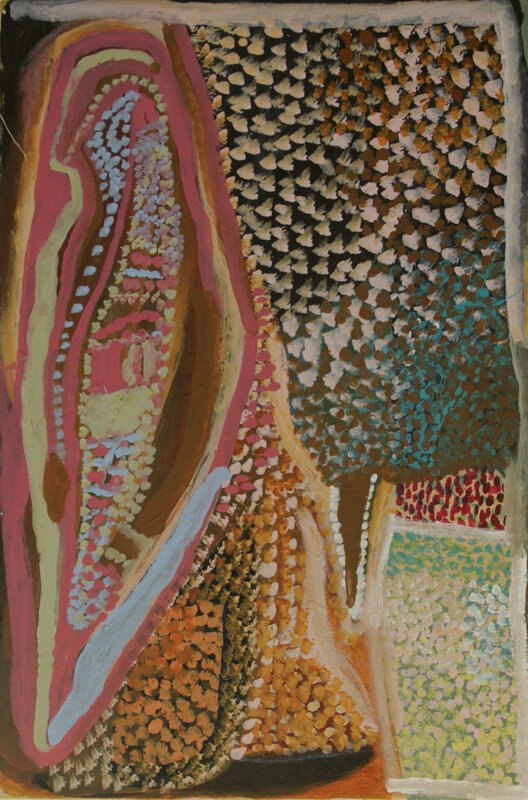 Her bountiful and interwoven depictions of the waterways, geological formations and flora around Aurukun show her to be a painter of great vision and complexity. Mavis Ngallametta, My Country - Kendall River 2017, natural ochres and charcoal with acrylic binder on linen, 201 x 272cm. © Mavis Ngallametta. Image courtesy the artist and Martin Browne Contemporary. Mavis Ngallametta in front of Kendall River, 2012. Photo: Martin Browne. 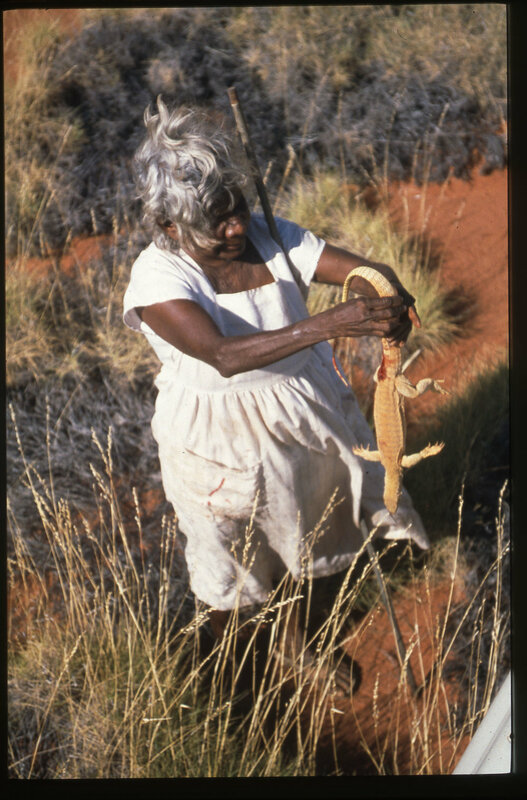 Mavis Ngallametta collecting white ochre, Ikalath. Photo: Martin Browne. Like a number of prominent female Indigenous artists, Mavis began her career as a weaver. Taught by senior Wik and Kugu women on country and at the mission school, she became proficient in, and renowned for, creating mats, baskets and dilly bags from cabbage palm and pandanus. In 2009 she became involved with Ghost Nets Australia, a movement spearheaded by Indigenous communities to bring attention to the plastic fishing nets killing marine life and making landfall on beaches around Northern Australia. The project eloquently marries artistic and environmental concerns in the creation of beautiful sculptures woven from discarded nets. In 2008 Mavis began experimenting with painting, participating in a workshop at the Wik and Kugu Art Centre run by facilitator Gina Allain. Relatively quickly she began working in two dimensions with natural ochres and charcoals. Whilst not prolific - she has completed less than 40 large scale paintings in the last seven years - Mavis’ output has been impressively consistent in terms of quality (almost a quarter of those works have been acquired by public institutions such as Queensland Art Gallery’s Gallery of Modern Art, National Gallery of Australia and the Art Gallery of NSW) and artistic vision. Despite her success, Mavis’ achievements have been quietly won - her luscious, multi-layered works are still unknown to many. Mavis Ngallametta, Pundum 2016, natural ochres and charcoal with acrylic binder on linen, 270 x 199cm. ©Mavis Ngallametta. Image courtesy the artist and Martin Browne Contemporary. Mavis Ngallametta, Small Horse Creek 2017, natural ochres and charcoal with acrylic binder on linen, 272 x 201cm. ©Mavis Ngallametta. Image courtesy the artist and Martin Browne Contemporary. Mavis depicts her traditional country of Kendall River, but also draws inspiration from other places around Aurukun where she lives. “At the moment I love painting the swamps and swampy areas”, Mavis says, in conversation with Gina Allain. 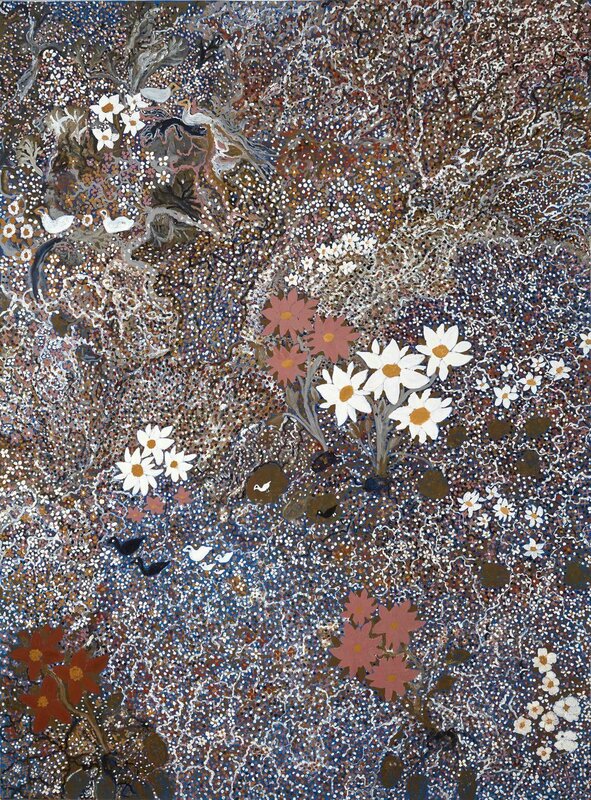 Swampy Area at Yalgamungken 2017, depicts the flowers and birds that appear at the end of the dry season at Yalgamungken, where she collects her yellow ochre. Swampy landscape around Aurukun, Cape York Peninsula in Far North Queensland. Photo: Gina Allain. Mavis Ngallametta, Swampy Area at Yalgamungken 2017, natural ochres and charcoal with acrylic binder on linen, 272 x 201cm © Mavis Ngallametta. Image courtesy the artist and Martin Browne Contemporary. Mavis Ngallametta, Low Down Swamp 2016, natural ochres and charcoal with acrylic binder on linen, 270 x 199cm © Mavis Ngallametta. Image courtesy the artist and Martin Browne Contemporary. Mavis Ngallametta fishing. Photo: Gina Allain. Mavis Ngallametta painting large scale work. Photo: Gina Allain. 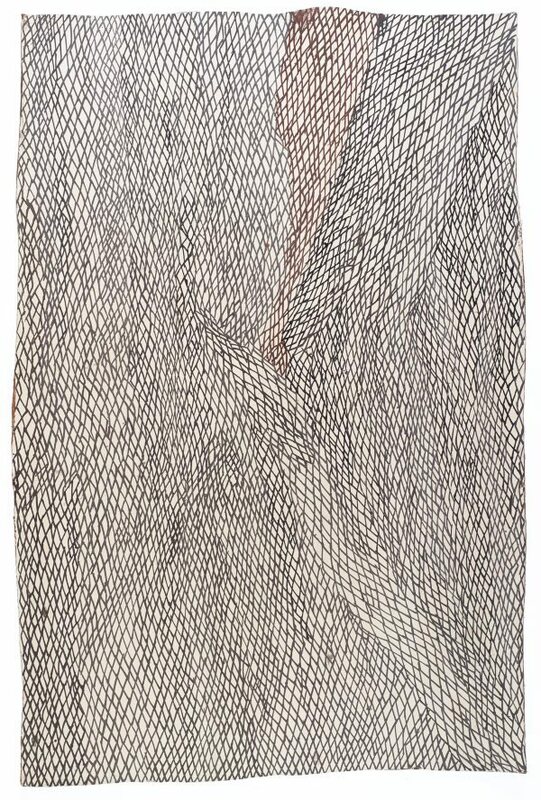 Her environmental concerns, so powerfully expressed in her ghost net weavings, are sometimes present in Mavis’ paintings too, with the fishing nets and oil drums that wash up on the beach at Aurukun incorporated into her densely painted compositions. The presence of this unwanted detritus is jarring alongside depictions of wetlands in full flourish, and reminds us that for artists like Mavis to continue their relationship with these bountiful ecosystems, they need protection. This post first appeared on The Design Files on 10 October 2017. Mavis Ngallametta, Ikalath #6 2012, natural ochres and charcoal with acrylic binder on linen, 276 x 195cm. ©Mavis Ngallametta. Image courtesy the artist and Martin Browne Contemporary. I was born in the Great Sandy Desert. My mother never put me in a blanket. I never saw my father. We walked from the desert along the Canning Stock Route. We walked because we had no motorcar. We carried our swags on our heads. To provide some context for this incredible statement on the Mangkaja Arts website, the Canning Stock Route is almost 2000 kilometres in length and traverses three deserts — the Great Sandy, the Little Sandy and the Gibson, in northern Western Australia. Tjigila Nada Rawlins is one of a generation of Indigenous people whose livelihoods have centred around understanding the elusive yet bountiful offerings of these hot, harsh, desert climates. Nada Rawlins, Linjalangu 2017, acrylic on perspex, 60 x 90cm. Photo: Mangkaja Arts. A highly sought-after and idiosyncratic painter, Nada works through Indigenous-owned and operated Mangkaja Arts in Fitzroy Crossing. Her paintings are distinctive, robust and highly saturated interpretations of her country. Nada was born about 1936 near Kirriwirri, in the southern stretches of Wangkatjungka country. Nada’s family, traditional owners of this part of the desert, are expert at sourcing fresh water from the Percival lakes, a chain of warla (salt lakes) spanning hundreds of kilometres. Nada paints the warla, the jilas (living freshwater holes) and the jilji (sandhills). Stripes and long lines represent “the places she walked with her family as a young girl” (Mangkaja Arts). A dingo on the salt lakes of Warla, 1990s. Photo: Mangkaja Arts. Nada’s career is long and varied. 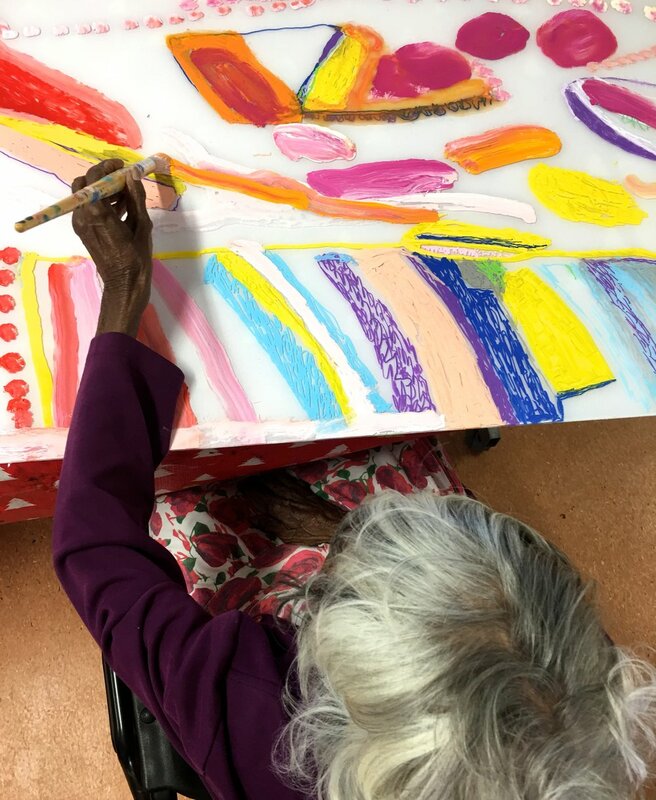 She began painting in the 1980s at Fitzroy Crossing’s Karrayili Adult Education Centre. When the Mangkaja Arts centre was built, she began working there, largely teaching herself through observation of other artists. Recently Nada has begun experimenting with acrylic paint and paint pens on Perspex, with very exciting results. She won the Shinju Art Prize in Broome for her first piece on Perspex in 2016, and this year has another Perspex piece in the National Aboriginal and Torres Strait Islander Art Awards, currently on show at the Museum and Art Gallery of the Northern Territory. Nada Rawlins working on a Perspex work, 2017. Photo: Mangkaja Arts. Nada Rawlins, Yimirri 2017, acrylic on canvas, 90 x 90cm. Photo: Mangkaja Arts. Nada is now quite elderly, but her output belies this fact – she creates work with incredible energy and pulse. This dynamism seems borne out of her intimate knowledge of her country’s wealth and abundance. 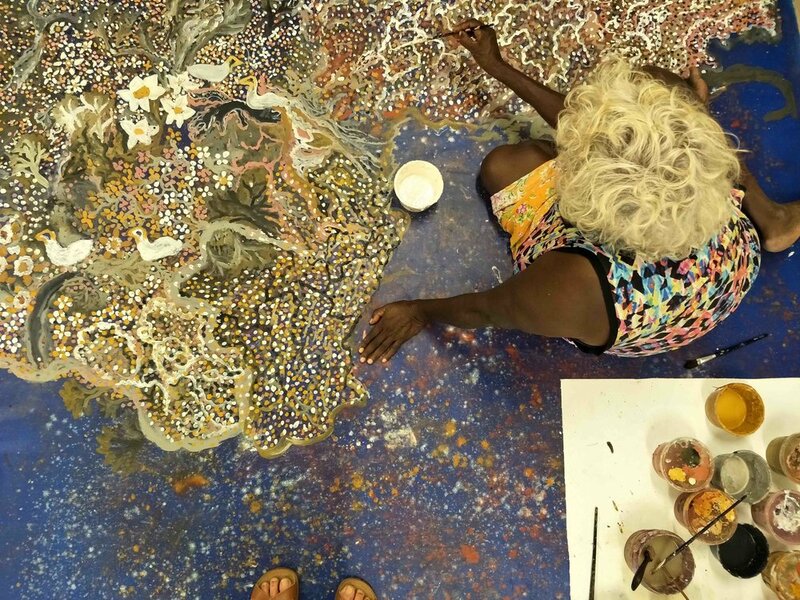 Speaking of one of her homeland’s key waterholes, Nada says: “This is Kirriwirri Jila… The water never dries up in this jila – this is living water” (Japingka Aboriginal Art). Historical image of Nada on a trip to Warla – the salt lakes in her country – in the 1990s. Photo: Mangkaja Arts. Nada Rawlins, Yimirri 2017, acrylic on canvas, 60 x 90cm. Photo: Mangkaja Arts. Nada’s work is available through Mangkaja Arts, as well as a number of commercial galleries including Vivien Anderson Gallery (Melbourne), McCulloch & McCulloch (Victoria), ReDot Gallery (Singapore) and Outstation Gallery (Darwin). Thanks to Nada’s daughter Nita Williams and Mangkaja Arts director Jennifer Dickens, who sat down together to talk through these questions with Nada. Thanks also to Belinda Cook for her assistance with this piece. This post first appeared on The Design Files on 14 September 2017. Nada Rawlins painting with Mangkaja artists at Warla, 1996. Photo: Mangkaja Arts. (L-R): Colleen Ngwarraye Morton, Rosie Ngwarraye Ross, Margaret Kemarre Ross and Beverly Pula Luck searching for bush medicine. Image courtesy Lara Damiani. Documentary film maker Lara Damiani of Think Films has made a name for herself capturing the stories of people and communities. Working with NGOs, international aid and humanitarian organisations, "and others with a passion for social development and social justice", Damiani's work often takes her to remote places. In 2010 Ampilatwatja became one of those places, when she embarked upon a journey to the Central Desert that has culminated in a series of short films about the artists of Artists of Ampilatwatja. We were excited to learn of Damiani's work with the artists, two of which - Colleen Ngwarraye Morton and Rosie Ngwarraye Ross - are behind our Ampilatwatja Collection of fabrics and wallpapers. In 2010 Damiani made her first trip out to Ampilatwatja after learning about a 'walk-off' staged by residents of the community in response to the Northern Territory Government's intervention. After this introduction to Ampilatwatja, she discovered another event in that community's history - the 1949 'walk-off' in which Alyawarr elder Banjo Morton and a host of other Indigenous stockmen demanded fair wages in return for their labour at the Lake Nash Cattle Station. Drawn to this important but little known piece of post-colonial history, Damiani created 'Meet Banjo'. Through this work Damiani has come to know many of the women of Ampilatwatja. On her 2014 trip to the community she began filming artist Lily Kemarre Morton painting and telling the stories within her work. Damiani was inspired to obtain funding through the NT Government and returned in 2016 to begin filming the artists in earnest. "Most of the artists paint Arreth, which translates to ‘strong bush medicine’, demonstrating a deep connection to country. For the Alyawarr people, their land has provided and sustained for generations. The paintings pay homage to the significance and use of traditional bush medicine, allowing an insight into their community." The photo essay below captures a trip Damiani took with the artists, in which she learned more about the various bush medicine plants and their uses. Links to the seven wonderful films, with animation by Karu Karu Studio, can be found after these images. We would like to thank Lara for her generosity in supplying the imagery and background information for this piece. Artist Colleen Ngwarraye Morton showing some traditional bush medicine. Image courtesy Lara Damiani. Artist Kathleen Nanima Rambler showing a traditional comb - women used this to brush their hair. Image courtesy Lara Damiani. Artists Margaret Kemarre Ross (left) and Beverly Pula Luck (right). Image courtesy Lara Damiani.